Bigfoot is alive and well in the Pacific Northwest, Bigfoot lore at least. 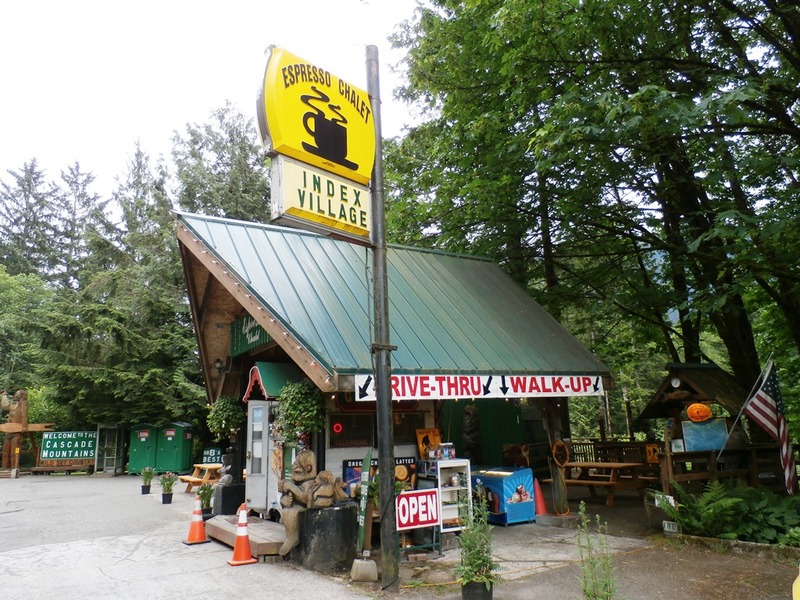 One of the best places to indulge our curiosity of the Sasquatch phenomenon is at Espresso Chalet, a roadside espresso stand along the Stevens Pass Greenway segment of U.S. Route 2 in Index, Washington. 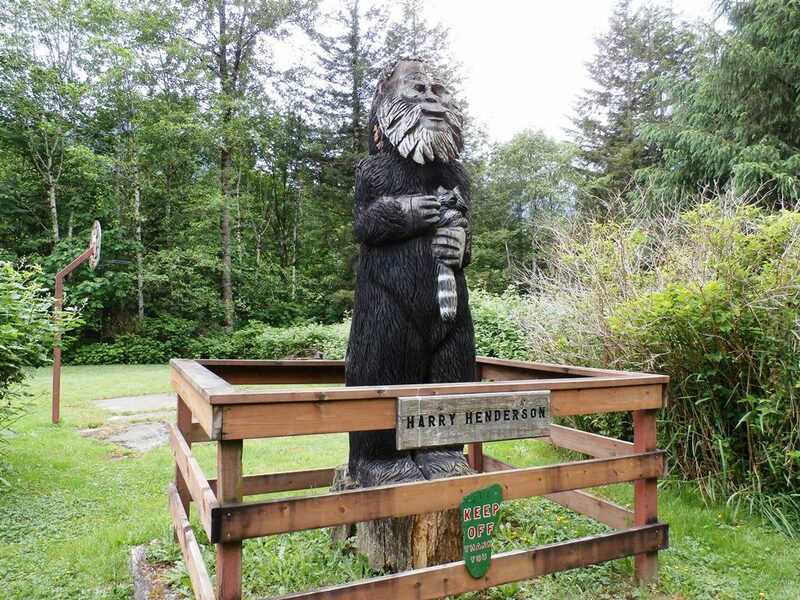 The Espresso Chalet has been at this location over 20 years and was built at one of the filming sites of the 1987 film ‘Harry and The Hendersons’. 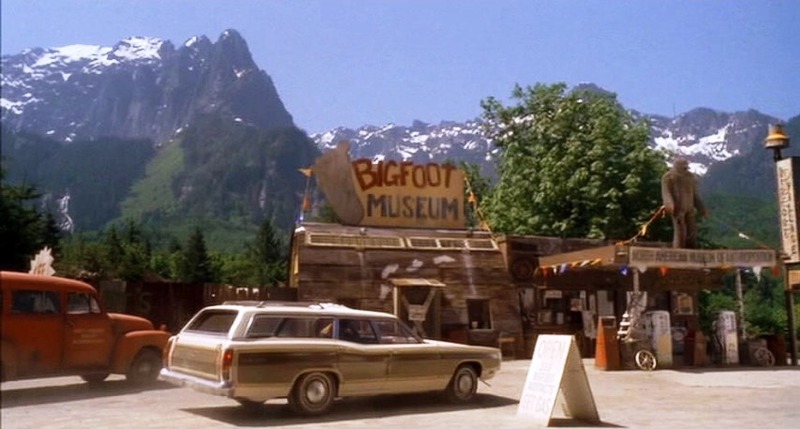 The location in the film appears as the “Bigfoot Museum”, with Mount Index in the background. Harry and the Hendersons “Bigfoot Museum” screenshot. 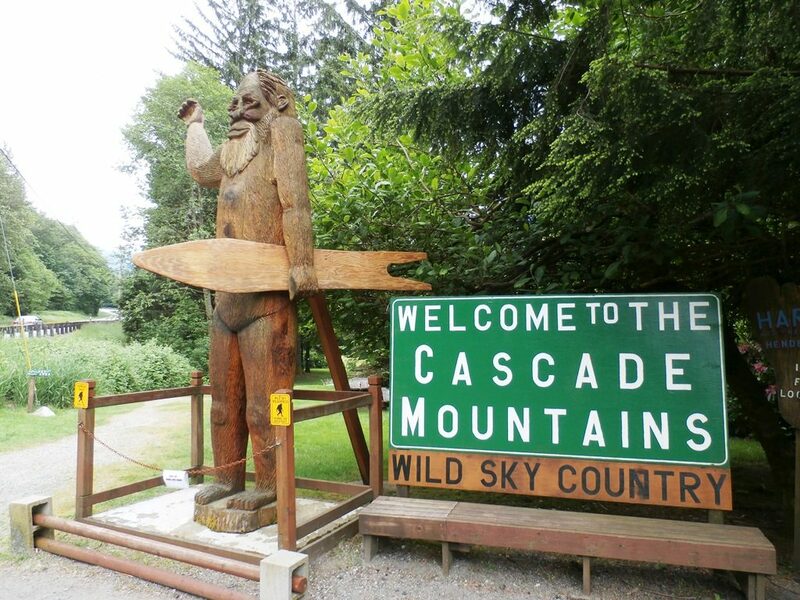 The biggest draw of the Espresso Chalet, apart from espresso of course, is the 14-foot chainsaw-carved statue of Bigfoot holding a surfboard. 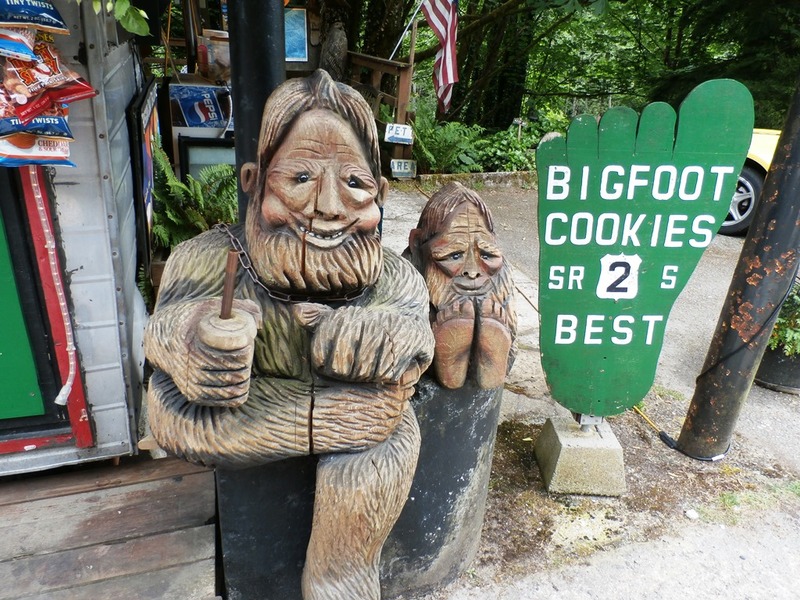 There are other smaller carvings near the front of the stand, including a smiling Bigfoot father enjoying a latte while sitting near his child. To the left of the stand is a downhill path leading to an older statue of “Harry” holding a raccoon. It’s not clear the history of the older statue (or the newer one), but if I can get more information I will update this post. 14-foot Bigfoot with surfboard statue. Bigfoot father and son carvings. Harry Henderson statue. Located a short walk from Espresso Chalet. The Espresso Chalet was built in 1992 by Sandy and Mark Klein from a converted 8-foot Aloha trailer. The stand offers a variety of espresso drinks, sodas, tea and snacks, in addition to a variety of Bigfoot-related souvenirs. It’s the only coffee stand for miles, so be sure to stop if you’re feeling tired. Stevens Park Greenway is variously known as the “Highway of Death” due to the number of accidents, so it’s better to be safe than sorry. The stand features picnic tables to sit and enjoy the scenery and portable toilets for customers. During the summer months, you have the option to “U-pick” blackberries from the surrounding area; just pay for what you pick at the stand. During my visit I bought a couple postcards, along with a Bigfoot-sized 6-shot Wookie Mocha. The mocha was very tasty, but it turned out to be a bit too much for me, especially since I had already had a Rockstar (yes, poor judgment on my part). Regardless, I hope to make the Espresso Chalet a regular stop for any future trips over Stevens Pass. Who knows, maybe next time the real Bigfoot will make an appearance, maybe even posing in front of one of the wooden statues? Follow U.S. Route 2 (U.S. Highway 2; US 2) to mile 36 at Index, Washington. While you’re in the area be sure to check out the tiny Wayside Chapel near the town of Sultan. For more information, see The Tiny Wayside Chapel near Sultan, Washington.